Tomas “Toto” Gana, of Chile, captured a dramatic win in the third Latin America Amateur Championship with the tournament’s first-ever playoff. 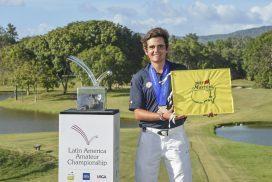 The 19-year-old calmly clinched a birdie putt on the second playoff hole to become the LAAC’s second Chilean champion. With the victory, Gana earned an invitation to the 2017 Masters Tournament, as well as exemptions into The Amateur Championship (conducted by The R&A) and the U.S. Amateur Championship (conducted by the USGA). He also earned spots in final qualifying for The 146th Open and the 2017 U.S. Open. Playing in the final group of the day with fellow countryman Joaquin Niemann and Mexico’s Alvaro Ortiz, Gana used a birdie on the par-4 15th hole to open a two-stroke lead over his playing partners. Gana staggered down the stretch, saving pars with a pair of putts on Nos. 16 and 17 and then bogeying the 18th as Niemann and Ortiz used birdies on the 17th to tie him after 72 holes at one-under-par 279. Gana made a gutsy up-and-down on the first playoff hole to save par and tie his fellow two competitors to extend their head-to-head battle. On the second playoff hole, the 386-yard, par-4 No. 10, Niemann bunkered his approach and Ortiz found the green, but left himself with a long, difficult putt. Hitting last from 99 yards, Gana used his 52-degree wedge and sent the ball two feet from the hole to set up an easy birdie putt. Ortiz and Niemann carded a par and bogey, respectively, to finish as joint runners-up. Despite his close call, Niemann was happy for his close friend’s victory. Founded in 1922, Club de Golf de Panama opened its current location in 1977, which is now 15 minutes from Panama City following the construction of a new highway. Jay Riviere and Charles Schaeffer designed the 18-hole course under the watchful eye of club member Carlos Arosemena Lacayo. The Club has been the venue of the Web.com Tour’s Panama Claro Championship since 2004.